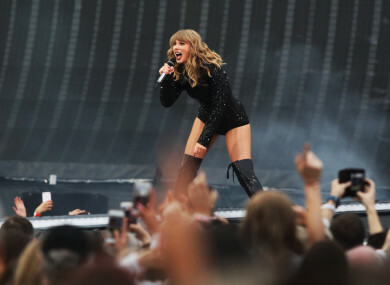 AN GARDA SÍOCHÁNA has been paid almost €1 million so far this year for the policing of private events – including €85,000 for two Taylor Swift concerts in Croke Park. Figures release to TheJournal.ie through a Freedom of Information request reveal some €996,823 was paid to the organisation for what is called ‘non-public duty’ in the first six months of this year. Non-public duty is performed by gardaí under arrangements made with organisers of events like sports matches, concerts and race meetings who engage the services of An Garda Síochána to perform duties to which they would not normally be assigned. The fee charged mainly covers overtime payments for the gardaí who work inside the event as they perform these duties outside of their normal rostered hours. Some traffic management close to the event may be included in the charge but other associated policing like additional patrols or handling associated public order incidents are usually not covered. There is no charge for garda reserves. €20,000 for policing at races in Punchestown on 24 to 28 April this year. €6,080 for the Red Bull Flugtag in Dun Laoghaire. The €996,823 paid to the organisation in the first six months of this year is likely to be a small proportion of the overall charges for 2018. Last year the organisation charged €4,911,838 in total for policing at sporting fixtures, concerts, festivals and other events in 2017. In January, Minister for Justice Charlie Flanagan said more than €1 million of this was outstanding, but he added that An Garda Síochána had only recently invoiced for these payments. There were non-payments of €128,458 and €237,651 for 2015 and 2016 and the minister said failure to clear debts results in payments being sought up front from hiring bodies for any future events. The operational policing plan for a particular event is formulated by the local management and they agree the charge with the organiser. Flanagan said a review was underway in An Garda Síochána regarding the charging criteria and a draft policy was to be completed in the first quarter of this year. An Garda Síochána did not respond to TheJournal.ie when asked whether this draft policy had been completed on schedule. Email “Taylor Swift gigs had highest garda bill for event policing this year”. Feedback on “Taylor Swift gigs had highest garda bill for event policing this year”.